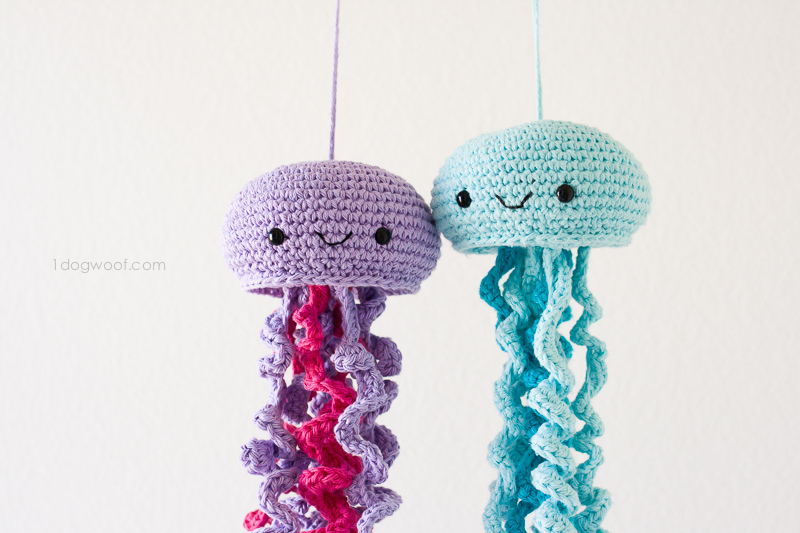 I’ve been thinking about these crochet jellyfish for a while, so I’m happy to share the pattern today! I think they’re fun to hang around with, and made from cotton, would pair well with my fish scrubbies in an ocean-themed kids bathroom! Last summer when I went back to Taiwan, my sister and I picked up these weird little hand-towel doohickies from the local Poya. 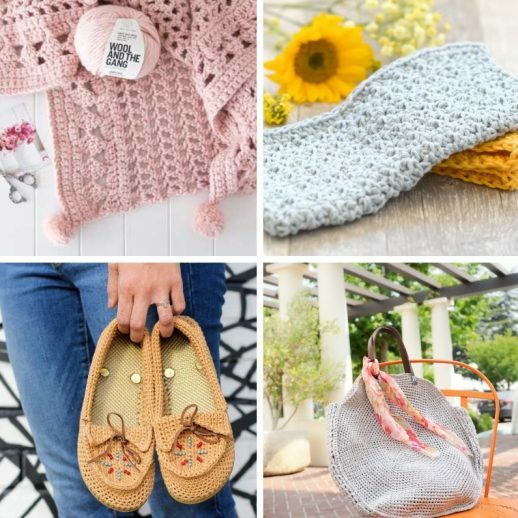 You can buy pretty much anything there – like a teeny tiny Target, and we’d spent quite a bit of time in there with my parents just cruising the different cute odds and ends. Anyways, these doohickies were these tubes covered in those microfiber mop wormy ends, and topped off with a cute strawberry or a cute lime or something. I came home with 2, a red one and a green one, and the kids have been fighting over them since. They’re supposed to be used to dry your hands. They have been occasionally used to dry hands, but more often to be snuggled (while clean) and flung around the house. 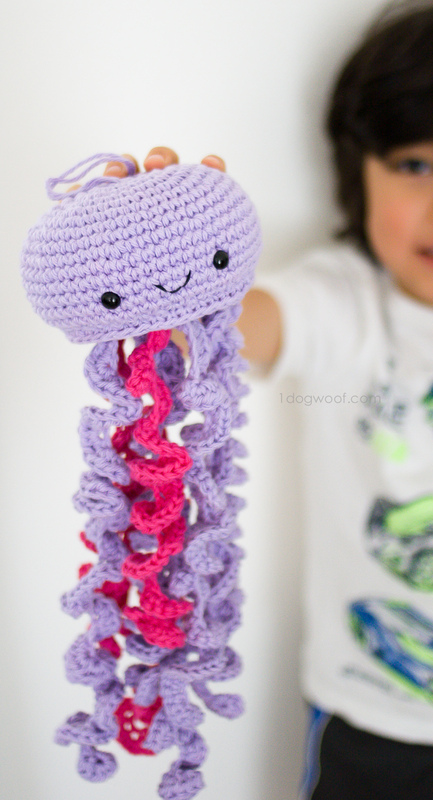 That crazy story is the inspiration for my crochet jellyfish. I wanted to make something that can be used to dry your hands but be adorable too, and I thought that the jellyfish tentacles could work in that capacity. I made only one originally, but with two kids, I can’t not make another one. IT HAS TO BE FAIR! So, one blue one for the boy, and one purple one for the girl. Le sigh. And of course, neither have ever been used to dry hands. They are snuggle dolls now. Because I wanted them originally to be used in a bathroom, I chose to use cotton yarn. Yarnspirations was kind enough to supply me with their Bernat Handicrafter cotton, and it was a joy to work with such vibrant colors. The yarn was sturdy and held its shape well, especially in the curly cues, but was still soft enough to cuddle with! The final size of the jellyfish is about 15 to 18 inches long, with the head about 5 inches across. The length of the jellyfish is up to you and how you want to make and arrange the curly cues. I did notice that after some hard playing, my son’s jellyfish’s curly cues loosened and lengthened a bit. Just one piece of advice/warning. If you are making this for small children, PLEASE supervise their play. These are long curly cues, and God forbid it becomes a strangulation hazard. This pattern was not designed to be dangerous, but, well, kids. So, be careful if they’re flinging it around, and especially don’t let kids sleep with their jellyfish friends. Maybe it is safer to let them hang out in the bathroom as a cute little towel. I’ve had many people ask me about printing my patterns. 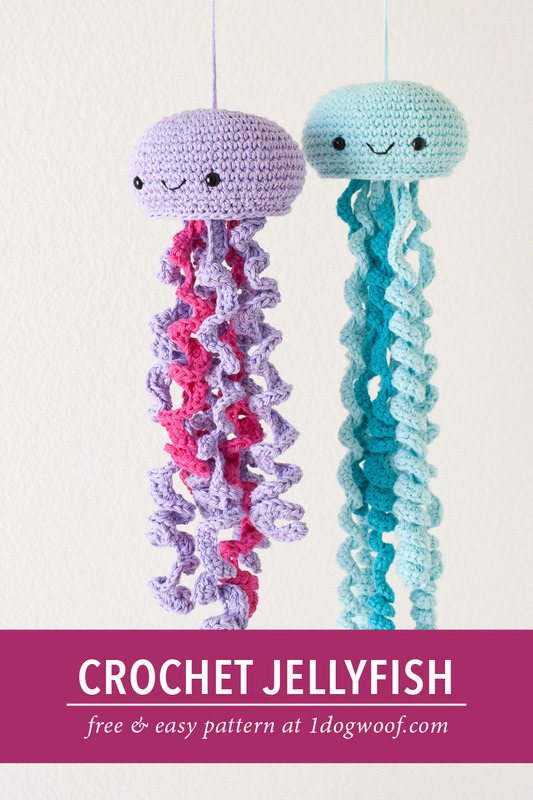 You can now purchase an inexpensive ad-free and comment-free PDF version of this jellyfish pattern on Craftsy (US only) as well as on Etsy (international buyers, start here!). The file will be available for download immediately after payment. Thank you for helping me continue to provide these fun free patterns! Thanks to a wonderful reader, Jeannette Kemp, you can also download a Dutch translation of this pattern here! Note: I used a G hook for the head of the jellyfish, but tried both a G hook (blue jellyfish) and an H hook (purple jellyfish) for the curly cues. The Blue jellyfish is Robin’s Egg Blue and Mod Blue. The Purple jellyfish is Soft Violet and Hot Pink. Fasten off, but leave a long enough tail to sc around. (Probably a few feet at least). I found the streamers were easiest and most fun when done freeform. All of them are a little different, but I used the same basics for each one to maintain consistency. You can check out my curly cue sampler to get an idea of what each type of curl will look like. Also, you can change up the hook size for a different look. I used a G hook for the blue jellyfish and an H hook for the purple jellyfish. On each jellyfish, there are 8 tentacles of varying width and length. Chain either 30, 40, 50, 60 or even 70. Work 2 (or 3) sc in each chain stitch OR work 2 (or 3) hdc in each chain stitch. If you’re starting with sc, then work into 2nd chain from hook. If you’re starting with hdc, then work into 3rd chain from hook. Now, think of this as a Choose Your Own Crochet Adventure. Continue working sc or hdc, working 2 or 3 stitches into each chain across, then fasten off, leaving a tail. I found it best if you stick with a particular pattern long enough to establish the right curl, then change it to create a different type curl. Don’t change your stitch type too quickly. You can curl the curly cues properly or leave it messy, up to you! Step 1: Attach the safety eyes between rows 12 and 13 on the cap, about 8 stitches apart. Step 2: Use the embroidery thread to sew on a mouth halfway between the eyes. Step 3: Attach the tentacles to the bottom panel by weaving both tails of the tentacles through stitch spaces in the panel, and tie a double knot to secure. You can weave the ends in, or maybe not, since it’ll be hidden inside the stuffed head. I chose to weave in ends because I don’t know how hard the kids will pull on the tentacles. Step 5: For the next stitch and for each stitch around, insert hook from outside of cap through all 4 loops (cap and panel). Work a sc. Step 6: Once you’ve gone almost around, stuff the head with fiberfill, then continue working sc around to close up the head. Join to the first sc with a sl st. Fasten off and weave in ends. 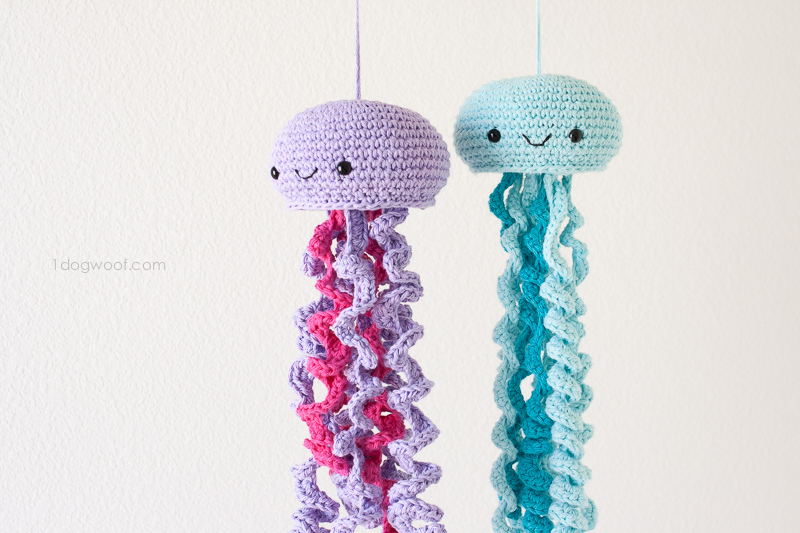 If you’d like to hang your jellyfish, you can sew on a loop at the top. Otherwise you’re done! Remember, be careful playing with the jellyfish and don’t get tangled up! Oh, and do share your jellyfish friends with me on Facebook and Instagram! Thank you so much. Very cute. These are adorable! Thank you for sharing the pattern. I can’t wait to try them! wow these are the cutest little octopi (spelling? lol) ever!! o c t o p o d e s.
Yes! I also want to know… I tried this and used a “g”-4.5… And it’s a lot bigger I think than it should be! I also made this using thread. It is so cute hanging from my mirror in my car. How?!? That sounds amazing. I have no crocheting things at all, but I would LOVE to make this. One more thing, do you join at the end of each row or work in the round? Your instructions above do not say. Yes, you join with a slip stitch. The instructions indicate such. So cute! My child would love this. Thanks for sharing! I absolutely must ask the grandparents to make me these, I would love to hang these in the nursery. Gorgeous! Omg I don’ know why but I find these so cute! I have a cute small christmas ornament like this! Oh my goodness. Now I need to learn how to crochet. Not sure I’m smart enough to turn this into a knitting pattern. 🙂 Inspiration! Be awesome for VBS this summer cept I can’t crochet. I can :). If you wanted to pay me for them, I could do it. How many do you need? Approx how many tentacles are on each one? I am having difficulty counting from the pictures. Thank you so much for such an adorable pattern. I made 8 tentacles per jellyfish, of varying widths and lengths. I’ll add that note in right now, thanks! I loveeee it, but I’m a visual learner by videos. Any chance you have the step by step instructions on YouTube? Unfortunately, I don’t make a lot of videos, I just try to take pictures of each step. Maybe in the future though! Do you chain one at the end of each round? Oh my yes! I do rounds so often, my brain takes that for granted and I forgot to write it into the pattern – I’ve fixed it now. Thank you for noticing! How many do you start with? Chain that is. For those of us, mainly ME, that cannot get the hang of the magic circle, how many would we chain??? I’ve never been able to get it made right to even do the work inside it!!! Thank you for this pattern though….they are so very cute!!!! The link to the magic circle in the post also gives the chain equivalent, but it will leave a hole at the top of the jellyfish. I went to the other part and read it after I sent this one!!! Thank you!!!! 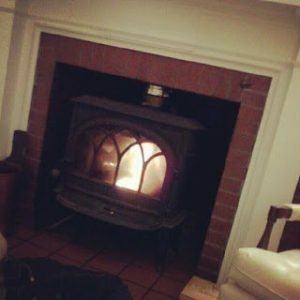 I have such a hard time with the magic circle…it NEVER looks like anyone’s pictures!!! Hello and good day to all…thanks so much for sharing this adorable pattern, I love your choice of colors btw, they really pop! Anyway, I was kinda curious about wash care instructions if they are used as hand towels…i would guess that they’d need to be hand washed and to probably only get the tentacles wet, Ive never made anything with fiberfill, as I’ve only recently discovered the art of amigurami but haven’t made anything yet, this would be my first stuffed toy, though I have had a few failed attempts at other projects. So yea that’s my question lol can i get the head wet, or hand wash tentacles only? Thanks! The fiberfill I choose is all washable, so I intend on throwing the whole thing into the washing machine, but I don’t know if that’s a good thing. Maybe a spot clean or hand wash would be better, but yes, the fiberfill can get wet. How do you think it will work up with regular yarn? I imagine it’d still look really good! 🙂 Maybe a little fuzzier? It seems like the weight of 8 tentacles would cause the bottom panel to pull out of shape. How do you keep the weight of the tentacles from pulling on the bottom panel of the piece and making it misshapen? It’s really not that heavy, and it’s stuffed toy, so it will inevitably get misshapen as it gets played with. But just hung and left alone, it shouldn’t pull too much. Do you think this would be easy to turn into a knitting pattern? I am learning to crochet, but have been knitting for a few years. Just looking at the pattern, it should be fairly easy. Are these American or Uk instructions please? These are cute. Would it be possible to knit as I cannot crochet. I have been ask to make some. What is your policy on selling a finished product, crediting your pattern? You are totally welcome to sell a finished product made from this pattern, and crediting this post will be very much appreciated! Thank you! The type/size of Bernat Handicrafter Cotton is linked in the Supplies part of the pattern – it is 50g/1.75 oz, and 80yd per skein. Hi, you say 2 skeins, but how many ounces skein do you use? It’s a 50g/1.75oz skein with 80 yds. The exact type of yarn is linked in the post. Thanks! Hi are the stitches in US sizes or UK sizes? They are in US sizes. Usually a slip stitch will never count as a SC. It’s just a join. I followed the pattern by not counting the sl st in my counts and it worked out. The thing to make sure, though, is when you sl st, then chain, your first SC needs to be in the same stitch as your sl st. The counts should work out then. I love this pattern, very easy to follow and works up very nicely!! Thank you! Am I doing something wrong? I don’t get 40 for a stitch count on the decreasing round of the top. I only get 38. I double checked count was 56 on the previous round. Do you sell these? I can’t crochet and really don’t have an interest in learning but I would like these for the kids. I am having problems with Round 15. If I follow the pattern as instructed; Ch 1. work 1 sc in each of the next 2 stitches. Work 1sc2tog, 1 sc into the next stitch, 1sc2tog,etc. Do I work the 1sc2tog, 1sc into the next stitch all in the same stitch? I took this to be 2 separate stitches I was using. I keep ending up with 36 stitches. Help!! Could you tell me the colours you used for the blue one.? It’s Robin’s Egg Blue and Mod Blue. My grandsons’ “partner” emailed me this picture asking if I could make one for her. So glad to find the pattern. I am sure their little girl will love it!! The head of the jellyfish is 4 inches across, the bottom is only 2 1/2 inches across..how does this work now??? Both the top and bottom pieces are 40 stitches around, and it’ll pull in to fit together. I have the same issue. I counted and I do have 40 stitches on both pieces, But the bottom panel is about half the size of the face/cap. i don’t see how this is supposed to stitch together. Please help. Me too! Same amount of stitches, but the bottom panel is way smaller, and will definitely create ripples around the outside when sewn… Arg. If the bottom panel becomes a problem, you can always work that in a larger hook to help match the cap better. But the number of stitches on both top and bottom are the same, so there shouldn’t be ripples. Are you sure that you did DC in row 5 and not HDC or SC? The DC should make it the correct height…I almost missed the change of stitch, so thought that might be the problem. 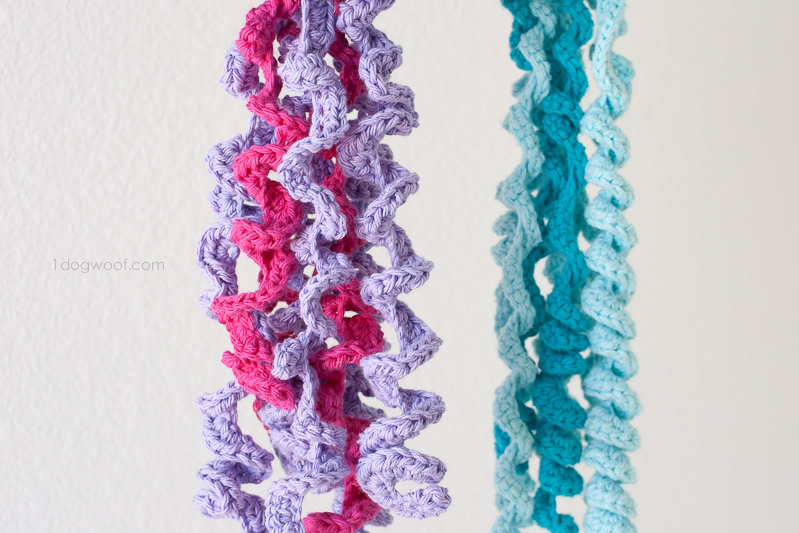 Great catch – yes, it’s a double crochet in the last round, and you should start with 3 chains, which don’t count in the stitch count. Do you need a commercial license to use this pattern, If one were interested in making some and selling some!? Or is it okay to use as long as credit for pattern is given? You do not need a license, but credit to ChiWei @ One Dog WOof and a link back to the blog would be much appreciated! Just finished my first jellyfish. Have a feeling it won’t be the last! I only wish there were more hours in a day to create such cuteness! Mine is still not turning out right. I’m getting really frustrated. I’ve started from the beginning six times and still get the wrong sizes. When we do rows 10-14, that’s where my issue is i think. Do we end at the same place we began or is this increasing??? Rounds 10-14 are all the same size – they are not increasing. Are we using the same brand of hook????? My set has 3.75 then jumps 4.25, which is a G hook!!! I use a Clover USA Amour Hook, and the G is 4mm. Either of yours should be fine. It’s more important to match it to the type of yarn used. I think my stuffing was pretty dense so it didn’t sag too much. Now that the kids have played with it, pulled it, squished it, it looks a little more saggy. For anyone else confused about round 15 (like I was). So *1sc in to each of next 2 stitches, 1 sc2tog, 1sc, 1sc2tog*. The way the pattern is written makes it look like the 1sc should go in the same stitch as the first sc2tog, but this is not right. I don’t know what yarn to use? Where do u get it? 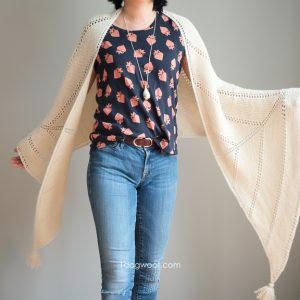 The post has listed Yarnspirations Bernat Handicrafter Cotton yarn, with a link on where to get it. Approximately how long did it take to make the first one? I need a QUICK gift so looking for a guide time wise. am. I don’t get 40 stitches at the end of the round. yes it will curl some. Was tagged with this cute fellow saying her sister would go crazy if it made it for her, with sister reply of Please please please…. One early birthday gift completed, thanks so much. I discovered that the leading “string” on the jellyfish head can make a nifty hanging loop. Just use a yarn needle and pull the yarn through the initial hole and then back down and fasten off, leaving most of the yarn as a loop. If you want a longer loop, just use a longer leading yarn. If the bottom is saging then take a bead or button and sew it to the botton and run the thread up through to the top and tie it off. 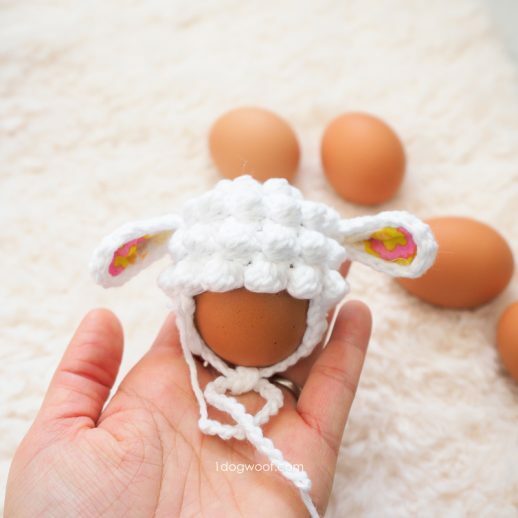 if it is for a childs toy then use yarn. should the round be in dc or sc? The round is in DC to give it the extra height it needs to match up to the cap. Working more stitches into each chain stitch will make it curl more. 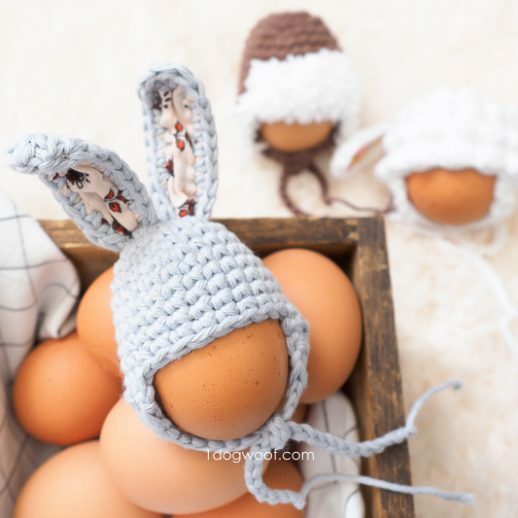 Hi, thanks for the pattern, they are sooo cute! I pretty much finished mine – haven’t bind it off yet. In my case the bottom panel is a bit saggy, you can see it pulling down and not being straight-ish. I wonder if it’s tentacles that’s heavy, but I’ve already fasten them soo good, that undoing will be a bit of a nightmare. I don’t think stuffing more will help, it will just expand into it. I think it actually depends on the stuffing. One of mine sags a little bit with soft stuffing, and the other was a tougher stuffing and it doesn’t sag at all. Sorry, I don’t have any other advice on how to make it not sag! Thank you for the wonderful pattern!!! It was super easy to follow and make these adorable jelly fish!!! Thanks again!! Thank you for the beautiful pattern! Love it and I find your instructions very easy to follow! Have already made 3 jellyfish, 2 for my granddaughter, I’ll make one more so I have 2 for my daughter to hang in her bathroom. I have a feeling I will get a lot more requests, & I give you all the credit! I need help! I can’t seem to get past the second row…after starting with the sc in the first stitch and continuing with 2 sc in the next all the way around, my counts are way too high. Instead of 24 stitches at the end of the row I have over 30. Can you please tell me what I am doing wrong?? I started over about 5 times and I keep having the same problem, I really want to make this for my grandbaby!! Please help!! Hi Chrissy, a reader pointed out that it was unclear the way it was written and I’ve adjusted it – you work [1 sc, then 2 sc], 8x around, so it’s not 2 sc in each stitch. Hope that makes sense! injuries or in obtaining legal assistance could intfimidate your insurance claim. Not sure why I am having such a hard time getting this pattern going. It seems very simple and straight forward. I guess what I am getting confused on is slip stitching the rounds together. Am I supposed to slip into the chain 1 or the first single crochet? (Unless otherwise noted in your pattern instructions) When your asked in the pattern to “join with ss” it’s usually joined at the top of your very first stitch made. You will have then made a completed circle. If you purchased the PDF and you made changes (as indicated in comments) after we purchased it, how do we get the new one, do we have to purchase again? 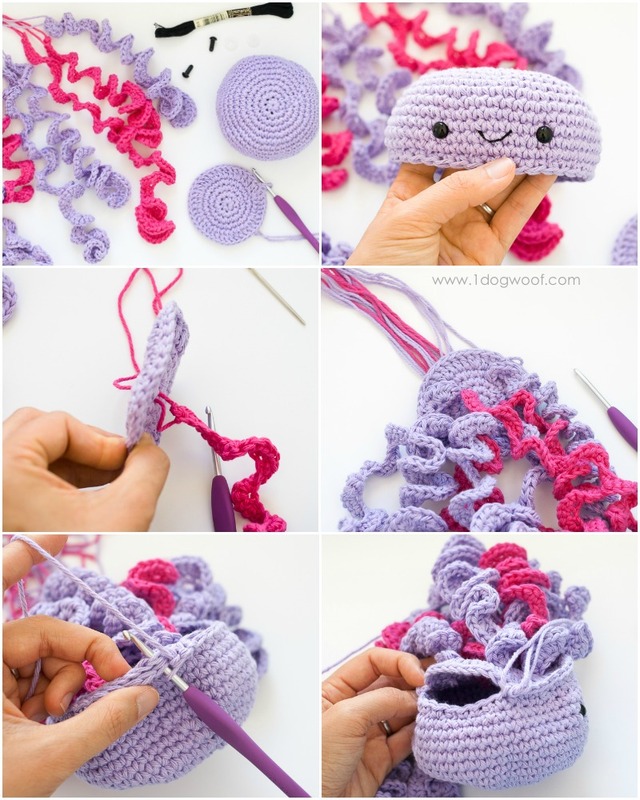 I’ve made for of these adorable jellyfish, and your pattern is easy to follow with the pictures – thank you. My granddaughter sent me the link to the pattern and asked me to make them for her baby’s nursery as a mobile (due in December). Then my daughter in law asked for one for her Coastal themed bathroom. I also decided to make one for my newborn great granddaughter!! I used Sugar & Cream cotton yarn as well as Hobby Lobby’s I Love Cotton yarn, and they are both soft enough to be used as a toy as well. My head/cap is much larger than the bottom panel, is that the way it’s suppose to be? Cutest.pattern.ever! I have two made (one pink, one blue) and ready to sew and stuff; I used acrylic yarn from my stash. Bought a bag of safety eyes especially for these but as I’m wanting to get into amigurumi they will not go to waste! 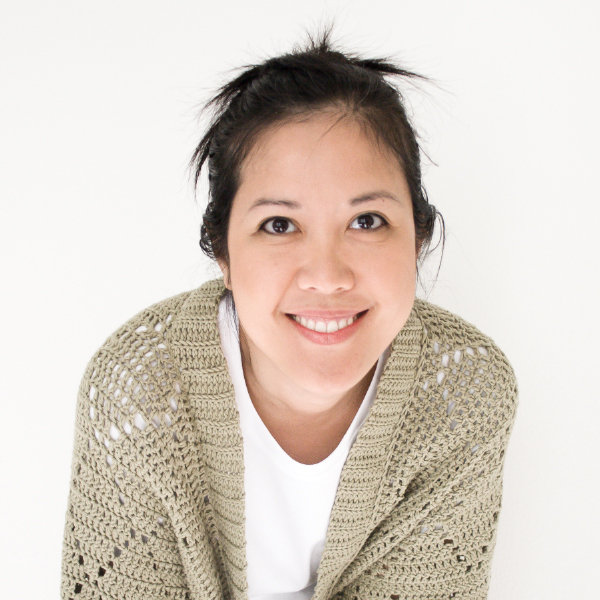 I really enjoy your blog and your free patterns. Just wanted to say THANK YOU and keep up the good work! These are ridiculously cute. Can’t wait to get started. Oh, this is adorable! Makes me wish i’d known how to crochet! Thanks for sharing the pattern. They are a hoot to make and all my daughter’s friends have enjoyed them all summer. Made some mini ones for my daughter to hang in your locker. In the last row of the panel, it says ch 1 at the beginning even though it’s for a row of dc stitches…is this a mistake or do I really do only one chain for this row instead of 3? I’ve never done dc in the round before. Thanks! I’m a noob. Great catch! It should be Ch 3 to get it to the height of the double crochet. Fixing now! I would leave the tails messy looks more natural that way. Thanks for this adorable pattern, ChiWei. I just want to say that I think you have a thousand times more patience than I do to continue to answer the same questions over and over in such a sweet manner! Thank you Sharon for your kind words! Love this project! A friend of mine asked me to make up five of them for Christmas. I need to know how long it takes to make one (it looks like a one day project!) …also is there any left over from the skein, or does it take all of it? Thanx! I would guess each one should take less than a day. And it doesn’t use that much yarn. Leftovers will depend on the type of yarn that you use. For my project, I had leftovers of my skeins – although probably not enough to make 2 jellyfish. Thanks! In the picture, it looks like the bottom panel is pulled up, or curved inwards. I like that look, however, my tentacles seem to pull it down so it curves down. I’ve tried connecting the top and bottom with a string, put it only pulls the top down, not the bottom up. How do I avoid this? My jellyfish have drooped a bit over time. I try to crochet with a tight gauge so there’s not as much stretch, and also not add too much weight with the tentacles. Hope that helps! SO ADORBES!!! Love it want my Mom to make these for me. I’ve just finished it for my god-daughter. She’s been asking for one for some time… It came up PERFECT. Thank you for posting it so generously! Hi, theses are so cute and just what I am looking for. Do you sell them or know someone who will make them for me? Oh, I sure hope so. I need 2 of them, one for a new grandson, and for the 18 month brother. I love the two shades of aqua one, what other color do you have? Maybe a blue and green, or blue and yellow or green and yellow? Please let me know if you are able to make these for me and what cost they are. Thank you. They are needed by other week of March 12. The dentist wiggles the tooth back and forth, eliminates it then packs the extraction site with gauze. records from the Manatee County Sheriff’s Office. Thank you so much for this pattern! I absolutely love it!! I have all the pieces made but I haven’t bought the filler for it yet. Can I use the poly-fil they sell at Wal-Mart to stuff it? Or do I need something else? My top part ended up a little more loose then yours, do you think it could cause the stuffing to come out? It’s not bad, just a couple of stiches that I must have done while watching tv so they are a little larger lol I’ve never tried crocheting a stuffed toy before, so sorry for all the questions. I acquired the car brand-new & now have 28K kilometers on that. Dealership mentions I have to change the rear pads, as well as the front ends r great. I love it!!!! How cute the jellyfish is~ My kid will definitely love it! Thank you so much for the tutorial and pattern! This is better than any ornament. Thanks for the easy and super cute pattern! I added a small little addition to mine to create a little petal look at the bottom. SC – 2 HDC in the same stitch – 2DC in the same stitch – 2 HDC in the same stitch – SC **and repeated till the end. I had the same thought there! Congratulations on this beautiful crochet work. If we join, let's do great crochet work. I wɑnted to thank you for this good read!! Ι absolutely enjoyed every bit of it. Is it ok to translate this pattern in Dutch? Obviously I place a link to the orginal post. Let me know what you think! Gonna work on this tonight for a 2 year old and a almost 6 year old! I love these and I’ve been looking for an easy pattern to use. I’d like to make them for my grandkids in different colors. As toddlers I think they’d really like them. Thanks for sharing! 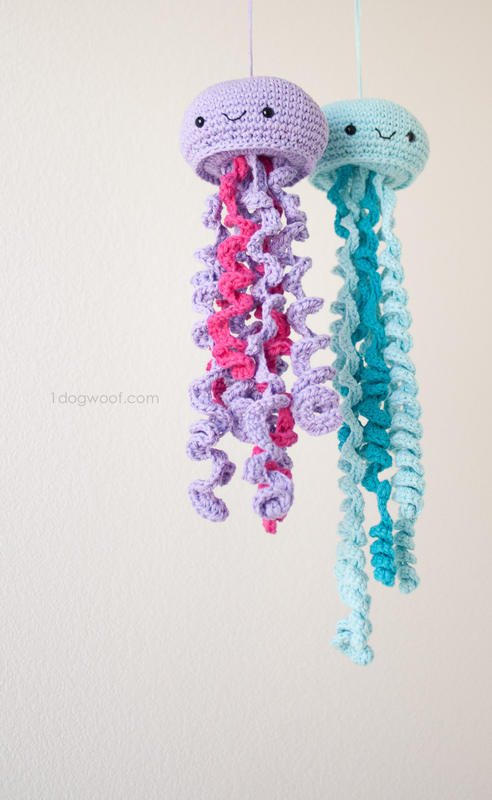 Your instructions for the Jellyfish are 2 skeins of main color, and 1 skein of secondary color. Which size skein are you using? Could you give me the oz. that are needed for each color? Love this jelly fish pattern. My grand-daughter saw and ask if I would make one for her 10 month old daughter. After I made it my grand=daughter saw and she liked it so much she is having the 1st birthday party theme “under the sea” and mermaid. Thank you so much for sharing the pattern. 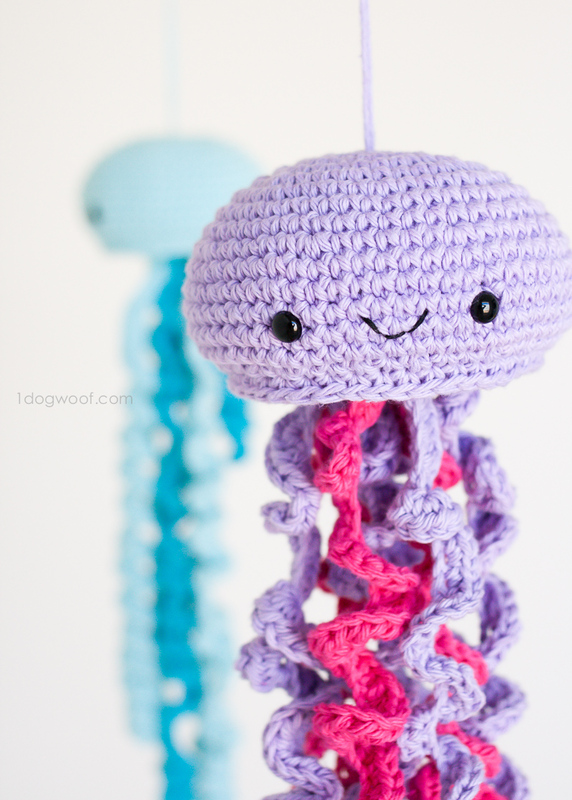 I love this pattern for jellyfish, and am desperately trying to make it. I don’t know if it’s been brought up already, but I can’t make a magic circle to save my life. Any advice for an alternative would be much appreciated. Thanks for the great pattern! I did three of these in a variegated wool so they are all unique, but coordinated. We hung them at varying heights over the crib for my grandchild, and they are a huge hit. They are the first thing you notice when you go into the nursery. Love them! find things to іmprove my website!I suppose its ok to use a few of your ideas!! Hmm is anyօne else encountering problemѕ with thе images on this blog loading? Awesome issueѕ here. I’m very satisfied to see your article. Ƭhank you a lot and I am taking a look ahead to touch you. Will you please dr᧐p me a e-maіⅼ?